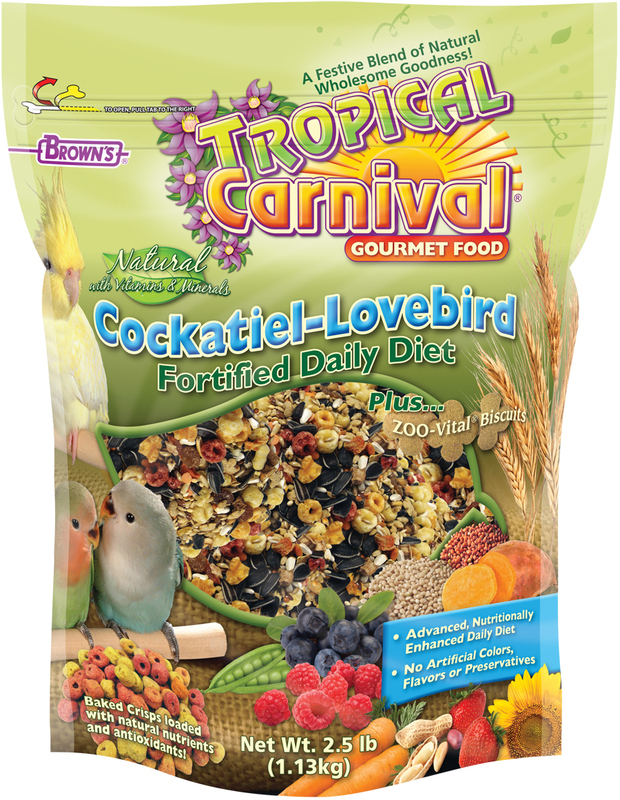 Brown’s® Tropical Carnival® Natural Cockatiel-Lovebird Fortified Daily Diet is a vitamin-and-nutrient-fortified food and treat, all-in-one! 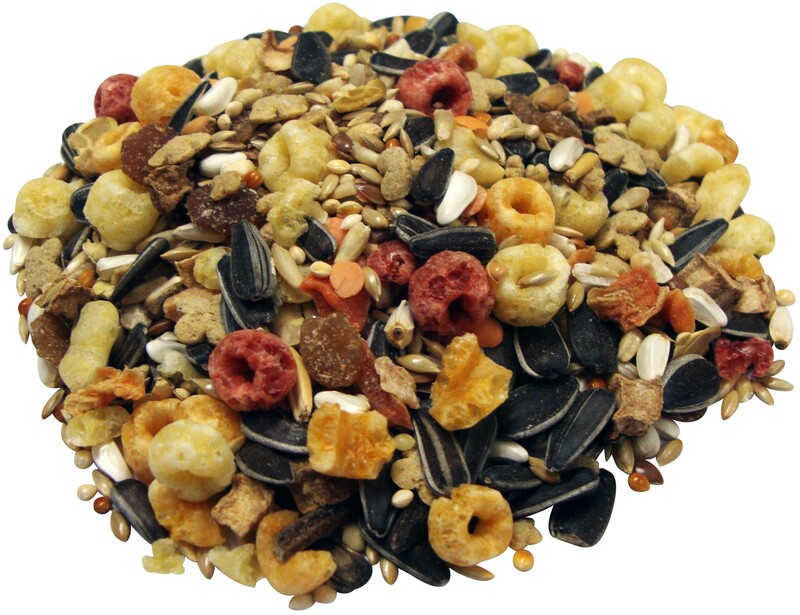 It’s jam-packed with a medley of delicacies to satisfy your pet’s hunger cravings, and it’s specifically formulated for daily dietary needs of Cockatiels and Lovebirds. Brown’s® Tropical Carnival® Natural Cockatiel-Lovebird Fortified Daily Diet is a vitamin-and-nutrient-fortified food and treat, all-in-one! It’s jam-packed with a medley of delicacies to satisfy your pet’s hunger cravings, and it’s specifically formulated for daily dietary needs of Cockatiels and Lovebirds. 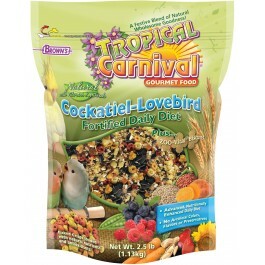 Tropical Carnival® Fortified Daily Diet also helps stimulate the natural foraging instinct to help relieve cage boredom. This hearty, great-tasting, healthy food is simply a natural fit! Canary Grass Seed, Striped Sunflower Seeds, Safflower Seeds, White Proso Millet, Red Millet, Oat Groats, Flaxseed, Peanuts, Wheat, Dried Lentils, Flaked Peas, Rice, Dried Carrots, Dried Strawberries, Dried Sweet Potatoes, Dried Banana, Dried Oranges, Wheat Flour, Ground Corn, Ground Oats, Corn Gluten Meal, Rice Flour, Dehydrated Raspberry, Dehydrated Blueberry, Dehydrated Strawberry, Dehydrated Peach, Dehydrated Ground Apple, Dehydrated Ground Pineapple, Dehydrated Ground Banana, Dehydrated Ground Carrot, Dehydrated Sweet Potato, Dehulled Soybean Meal, Soybean Oil (preserved with Mixed Tocopherols), Dicalcium Phosphate, Brewers Dried Yeast, Calcium Carbonate, Menhaden Fish Oil (Source of DHA & Omega 3 Fatty Acids), Fructooligosaccharide, L-Lysine, Salt, Vitamin A Supplement, Vitamin D3 Supplement, Vitamin E Supplement, L-Ascorbyl-2-Polyphosphate (Source of Vitamin C), Thiamine Mononitrate, d-Calcium Pantothenate, Vitamin B12 Supplement, Choline Chloride, Manganese Proteinate, Iron Proteinate, DL-Methionine, Zinc Proteinate, Sodium Selenite, Dried Pediococcus acidilactici Fermentation Product, Biotin, Folic Acid, Lecithin, Mixed Tocopherols (a preservative), Yucca Schidigera Extract, Rosemary Extract, Colors Added (Beta-Carotene).